We all have our favorite go-to accessories, but keeping track of them can be a challenge unless you have a designated spot for them. Display and organize your favorite pieces in style with this innovative piece from Umbra. Prisma Jewelry Tray is a stylish alternative and unexpected twist on your typical jewelry tray. Proudly display your accessories with this eye-catching piece, part of the innovative and beloved Prisma family of products. 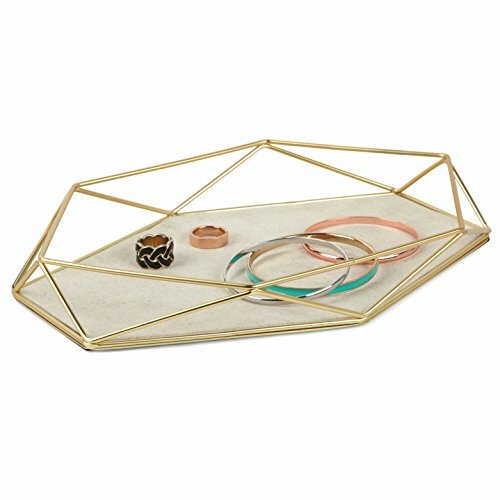 The sides of this tray are made of a geometric-shaped wire with a plated brass finish, creating an eye-catching look that will help show your jewelry off from all angles. The base of the tray has a sand-colored linen lining, which will prevent your jewelry from getting scratched. A felt liner on the bottom of the tray will ensure the surfaces you rest Prisma on will not scratch. Prisma Jewelry Tray measures 11 x 7 ¼ x 1 ½ inches (28 x 18.4 x 3.8 cm). The plated brass has a matte finish and linen on the base of the tray is sand-colored. Start displaying and storing your jewelry in style by ordering the Prisma Jewelry Tray today. SATISFACTION GUARANTEED OR YOUR MONEY BACK: Umbra is committed to the highest levels of quality and excellence and stand behind every product we make. We know you're going to love your purchase but if you're not completely thrilled for any reason (or even no reason at all), simply contact us within 30 days of receiving your order and we'll happily resolve the matter or issue a full refund.